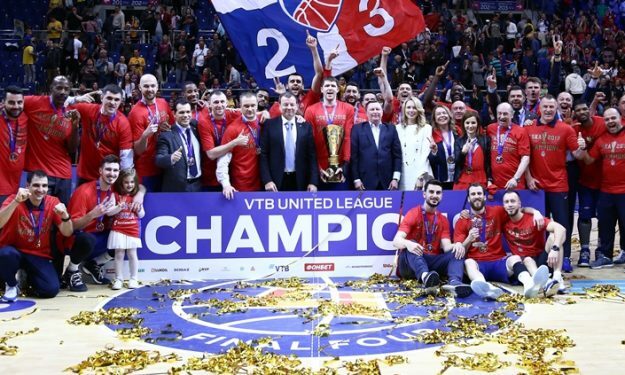 CSKA Moscow is named 2018 VTB League champion, after defeating Khimki Moscow in the final with 95-84. The Army Team sealed its seventh straight VTB League championship and its ninth overall. Nando De Colo saved another clutch-like performance for the final game of the season, finishing with 18 points and seven assists against fellow Moscow rival. Sergio Rodriguez nearly touched the double-double with 16 points and eight assists, while Cory Higgins finished with 20 points. The Spaniard was named also the MVP of the Final Four. Congratulations to my team, the players, management and everyone who played a part in this win”, said after the game coach Dimitris Itoudis: “We were very determined and demonstrated excellent basketball. We finished first in the EuroLeague regular season; we won the VTB United League regular season, so I think we deserved today’s win. We did not choose the opponents and battled to the end, for which we were rewarded. Congratulations to Khimki, UNICS and Zenit. Especially Khimki, since we played against them nine times this season. Even though we know each other well, it’s very difficult mentally to play so often against one team. Even Cleveland and Golden State played fewer head-to-head games this season”. Earlier in the day, Zenit won the third-place game against Unics with the incredible Kyle Kuric paving the way.